Chelsea play host to Leicester at Stamford Bridge on Saturday eager to extend their unbeaten home record this season. The Blues have yet to suffer a beating on their home ground and have also kept a clean sheet in each of their last four matches in London. They will definitely be confident of another win to nil against Leicester City, who scored only four goals in their last five games on the road. The Foxes are going through a difficult spell at the moment and prepare to travel to Chelsea on the back of a four-match winless stretch. 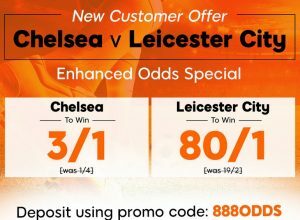 With only one win in last six league matches Leicester have been installed as underdogs with 888sport offering huge 80/1 betting odds on the visitors in their new customer enhanced odds special. At the same time, hosts have been given a price boost as well and you can back Chelsea at 3/1 to record a win. This new customer exclusive is available to players who register an account with 888sport through this link using code 888ODDS.